2019 Members Juried Show 2: Collage, Crafts, Drawing, Graphics, Mixed Media, Photography, Printmaking. February 21 - March 21, 2019. Juried by: Artists Gerry Bergstein and Gail Boyajian who reside in Cambridge, MA. Taylor House Bed & Breakfast, 50 Burroughs Street, Jamaica Plain, MA 02130, #34 on the JPOS Map. I am one of seven established artists exhibiting at Taylor House Bed & Breakfast. Come by to see art and taste some awesome catered food! Juried by: Abigail Ogilvy, Owner and Director, Abigail Ogilvy Gallery, Boston. I am one of seven established artists exhibiting at Taylor House Bed & Breakfast. Come by to see art and taste some awesome catered food! Juried by Ali Ringenburg, Director of the Sloan Merrill Gallery, Boston. Juried by Sally B. Moore, Associate Professor of Art at Fitchburg State University. Juried by Randi Hopkins, Director of Visual Arts at the Boston Center for the Arts. Juror Prize Awarded for collage art work. YouTube Interview CCTV speaks with Ann, featured in the Members Juried 2 art exhibit at Concord Art. 460 Commercial Street, Provincetown, MA 02657. Kathryn Schultz Gallery, 25R Lowell Street, Cambridge MA 02138. Summer Show – June 1, 2016 - July 30, 2016, JP Licks, 659 Centre Street, Jamaica Plain, MA 02130, www.jplicks.com. Seascapes and more... March 2, 2016 - May 31, 2016, Meet the Artist Reception, May 1, Sunday, 4-6pm, Wellness at Villageworks, 525 Mass Ave., West Acton, MA 01720, www.wellnessvw.com. Women Celebrate Art – March 1, 2016 - March 31, 2016, Boston City Hall, 3rd Floor, The Scollay Square Gallery, Reception on Friday, March 11, 4-5pm, gallery hours, 9-5, M-F.
BLUE New England Biennial | Open Juried Show Juried by Katherine French, Gallery Director Catamount Arts, VT, November 19, 2015 – January 5, 2016, Cambridge Art Association, Reception | December 3, 7-9pm, University Place Gallery, Cambridge MA 02138. Group Exhibit, work from annual NewHAT artist retreat in Jaffrey New Hampshire. The Exhibit: September - October, 2014. 50 Burroughs Street, Boston (Jamiaca Plain), MA 02130, (617) 983-9334. Gallery hours are Monday - Friday, 3 - 7 pm. The Exhibit: August 20 - September 1, 2014. 307 Old Main Street South Yarmouth, MA 02664, (508) 394-7100. Gallery hours are Monday through Friday, 9am-5pm. Saturday: 11am-5pm. Sunday noon-5pm. And every evening, by chance. Please view my painting, Arboretum Spring I, at auction. This painting is included in the Boston Summer Arts Walk at Axelle Fine Arts Galerie, 91 Newbury Street, Boston, Wed Jul 23, 2014, 04:00 PM - 08:30 PM. Tune in for the finale on Saturday, July 26, from 9–10:30pm on WGBH 2. The Exhibit: March 23 - April 11, 2014. Cambridge College Mass Ave Gallery, 1000 Massachusetts Avenue, Cambridge, MA. Gallery hours are Monday - Friday, 3 - 7 pm. The opening reception will be on March 29, 2014 from 4 – 8 pm, the work will be on view through April 11, 2014. The Opening Reception will be on Fri., April 4th, Reception 6:00 pm – 8:00 pm (Open to the public; no evening performance). Community Colors juried exhibition at United South End Settlements’ Harriet Tubman Gallery. The exhibit will be on view and open to the public November 12, 2013 – January 3, 2014. My multimedia piece, The Perfect Storm, is featured. The Opening Reception will be on Tuesday November 12, 2013 from 6 – 8pm at Harriet Tubman House 566 Columbus Ave located in Boston’s South End, Boston, MA, 02118 (617) 536-8610. 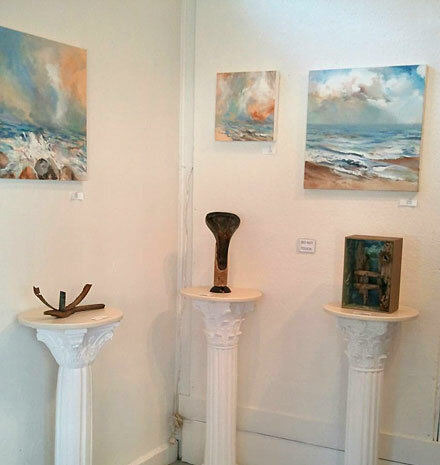 Bodin Gallery, 82 Main Street, Gloucester, MA 01930 (978) 283-2524. Local oil and watercolor paintings, beginning May 2013. Facebook site. Violence Transformed 2013 Group Show, Friday March 3 to Friday April 26, 2013. Opening reception, Thursday March 7, 6-8 p.m Harriet Tubman House Boston, MA, 566 Columbus Ave, Boston, MA 02118 (617) 536-8610. On Green, Annual Jamaica Plain Arts Council Juried Exhibition, Maliotis Cultural Center at Hellenic College, 50 Goddard Street, Brookline, MA 02445. June 2010. Witness, one person show, Vitale, Caturano & Company Art Gallery, Bentley College, Waltham, MA 02452. April 2008. Seasonal and Domestic Themed Pieces, one person show, The Boston Cheese Cellar, 18 Birch St. Roslindale, MA 02131. March 2008. Shape, juried show, Cambridge Art Association, Kathryn Schultz Gallery, 25 Lowell St. Cambridge MA 02138. Juried by Joseph Wheelwright, sculptor. January 2008. Red, juried show, Cambridge Art Association, University Place Gallery, Cambridge MA 02138. Juried by Jane Farver, Director, MIT List Visual Arts Center. November 2007 - January 2008. Family, one person show, Norumbega Point, 99 Norumbega Road Weston, MA 02493. October 2007. Luminescence, one person show, Newton Free Library, Newton, MA. June 2007. The Essence of Woman, Group Show, L'Essence Gallery, Boston, MA 2006. Solo Exhibit, Eaton Vance Managed Investments, Boston, MA. February 2006. Winter Exhibit, two person exhibit, West on Centre, West Roxbury, MA. Winter 2006. Two person exhibit, L'Essence Gallery, Boston, MA. November 2005. Jamaica Plain Art Association Group Show, First Thursday, Sweet Finnish, Jamaica Plain, MA. June 2005. 5 WOMEN @ JAVA JO'S. First showcase exhibition of the work of local area artists. JP's newest coffee shop, JAVA JO'S, presents Jamaica Plain's newest art collaborative: 5 WOMEN, Boston, MA. Spring 2005. Spring Group Show, L'Essence Gallery, Boston, MA. April 2005. Loring-Greenough Biennial, Juried Show, benefit and silent auction for the Loring Greenough House and Saint John's Episcopal Church, Jamaica Plain, MA. April 2005. School of the Museum of Fine Arts Annual December Benefit Show, Boston, MA. December 2004. Annual Footlight Club/Jamaica Plain Art Association Group Show, Jamaica Plain, MA. November 2004. Annual Footlight Club/Jamaica Plain Art Association Group Show, Boston, MA. November 2003. Annual JP Licks/Jamaica Plain Art Association Group Show, Jamaica Plain, MA. August 2003. Loring-Greenough Biennial, Juried Group Show, benefit and silent auction for the Loring Greenough House and Saint John's Episcopal Church, Boston, MA. June 2003. Group show, Dragonfly Gallery, Martha's Vineyard, MA, group show. June 1998.